This piece is an excerpt from an original article published as part of the eBook El ecosistema de la Democracia Abierta series, which can be found here. The uncontrollable political and democratic crisis of our times has driven citizens to promote initiatives that eliminate or undermine different intermediaries that require an individual to be heard by senior officials and for their ideas to be applied or at least considered. These initiatives, one hundred per cent characteristics of bottom up democracy, are based on a concept provided by Spanish computer programmer Pablo Soto: disintermediation. The mechanism which allows people to take their own decisions that is revolutionising citizen participation. Based on this concept, in 2011, Propongo – a free software program that allows users to propose ideas that will later be put to a vote – was created in Madrid. All ideas should be bottom-up, in other words, decentralised, safeguarding principles of disintermediation. Thanks to developments such as this, public administrations have started waking up and becoming aware of the diverse power decentralisation mechanisms, due to the need to find new and innovative forms of motivating citizen participation. 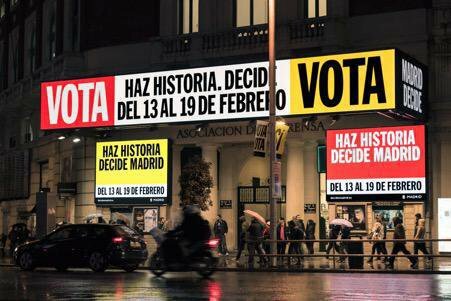 In the same vein, the local government of Madrid launched Decide Madrid, a participatory platform with which a bottom-up democratic path was paved on the part of the public sector. It has been assigned a budget of 100 million euros and has made many citizen requests a reality, that have been voted for by the population of Madrid and are supported by at least 1% of people over 16 and registered in their municipality. Thus, and beginning with these two examples, this text explains different initiatives that have been developed in the city of Madrid and that show how it is possible to generate transformations from changes in traditional political paradigms, adapted and focused in agreement with the particular needs of every region.